Welcome back to another issue of Milk Bar Mornings. Today we will be continuing in the mini-series, where we look at various songs from the Zelda Series for Guitar sheet music book, filled with songs from nearly every Zelda game out when the book was released. This time, we will be looking at songs from Ocarina of Time, that have been included in the collection. The book features six different Ocarina of Time songs, but like usual, we will be looking at three specially chosen songs, for both story and technicalities. Of course, since the songs have been adapted for guitar, numerous things have been changed, and from that the story has also been changed With that in mind, hit the jump below to see what we have in store! The Hyrule Field theme is one of the most iconic themes present in Ocarina of Time. Its powerful feeling and vastness supports the place its representing in every possible way, making it one of the best field themes present in a Zelda game. With that, the composers behind Zelda Series for Guitar have held the legacy of the theme, yet rather than going grand, with each note being a chord, the composers decided to create a much more heart warming and calm theme, focusing on a much more nostalgic tone. The themes basic structure and key points are still in there original format, yet the power behind it has been turned into a more quiet and relaxing cover. Chords consisting of up to three notes appear in the song, making sure that the grandness of the field is still being sent across, yet the melody simply accompanies them, and the chords and bass accompany the melody in return, creating a wonderful harmonic sound. The story behind the theme is a story of nostalgia. When the composers created this book, they focused on making certain pieces have a more nostalgic appeal than others. This theme was one of the few to be chosen to serve this purpose. Players who had originally played the game when it was still new would probably say that those first few steps onto Hyrule Field were some of the most overwhelming. Seeing a video game display the seemingly endless fields was something like out of a dream. Yet as the years went on, new Zelda games continued to be produced, each one getting larger and larger, until finally the Ocarina of Time Hyrule Field seemed tiny compared to the rest. The song mirrors the miniature grandness the song has with its light chords. With size, there was also beauty. When the Nintendo 64 came out, it was an eye opener to many gamers at the time. Seeing the world of Zelda in 3D was something that thousands looked forward to experiencing. Yet, like with the fields size, the beauty of the field seemed to go down, as with each 3D Zelda game to come, the art became better and better. Yet to support the beauty of the field, many trills and arpeggios are played, reminding the player of how amazing the field was to explore. Together this cover created a feeling of nostalgia that served as a major blast to the past. The Lost Woods is a very iconic location in not just Ocarina of Time, but the Zelda series in general. It has been featured in numerous games, and each rendition has its own flavor and mystery. The version in Ocarina of Time has always been bright, quick, and catchy. It contains a great beat, a unique bass, and of course, a melody that can ring through your head for hours. When it was adapted for guitar, it was done in a way very different than the original. Rather than being fast and bright, it is melodic and warm. A tone that I can only explain as Twilight Princess-y is created, similar to the Faron Woods theme. Usage of a simple melody, followed by a continuous base creates the calm and beautiful sound present in the song. The story behind this theme, is a story of understanding. The Lost Woods is a strange place, filled with strange creatures, strange people, and a strange path. The only point in the woods that is considered sane is the Sacred Forest Meadow, where Link’s friend Saria runs away to when she needs to be alone. Here it can be seen that the Lost Woods can be an approachable quiet place. 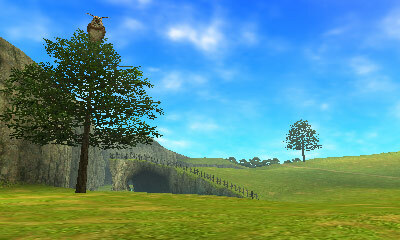 Though in the game there is no special theme for the Sacred Forest Meadow, the Lost Woods theme for the guitar fully portrays the serenity that is within the Lost Woods. The calm sound of it shows that through all the quirks and oddities that the Lost Woods contains, there still is a place where it keeps all of its serenity and peace. So when the composers highly simplified the Lost Woods theme when adapting it for the guitar, they also created a theme representing the place it can be. For out final piece we will be looking at one of the most nostalgic pieces in the whole entire series. That is the title theme for Ocarina of Time. It is very rare that someone can listen to a song from a video game, and relive an adventure they had once went through, fought through, discovered through, and learned through. Ocarina of Time‘s title theme is one of the few songs that can do that. Its simple sweet melody all supported by notes ascending in the back holds memories that anyone who has played the game can relate to. When the song had been adapted to the guitar, a new layer of charm had been added. Sporting a different key, with a lower melody, the song has been reborn. It’s more or less the same song, but the subtle changes like key and the melody being played lower changes the song and its story completely. The story in this theme, is a story of childhood. Most players played this game at a young age. Though I wasn’t around at the time of its release, I did play the game in elementary school. Many others could say the same. The game came in with so much mystery, and thousands of theories, ideas, fan creations, and stories branched off from the game, making the game larger than it already was. For a child, that was unimaginable, seeing an amazing adventure continue to expand beyond its source. All of that wonder is present in the original, yet the warmness of the lower melody, and the vagueness of the different key makes the game seem like something distant, yet nearby. The composers took the childhood memories created by the players, and put it into this song, creating the ultimate rendition of the title theme. That is all for this weeks issue of Milk Bar Mornings! Let me know what you thought of this weeks post and look forward next week, where we will be looking at more themes from the Zelda Series for Guitar sheet music book! Thanks for reading!